Patriarch of Jerusalem: Can a Gazan Child Ever Grow Up to Be Healthy? A touching testimony full of hope was given earlier this month by the Latin Patriarch of Jerusalem, Fouad Twal, on the situation of Christians in the Holy Land. Patriarch Twal was meeting with students and docents of the Pontifical University of the Holy Cross in Rome. The Patriarchate of Jerusalem, which covers a very vast territory, includes Israel, Palestine, Jordan and Cyprus, and gathers within it “the descendants in direct line of the Christians of the very first Christian community, the Mother Church of Jerusalem,” recalled Patriarch Twal. A small community, which shortly after evolved into two branches: the Ecclesia ex circumcisione (Judeo-Christians) and the Ecclesia ex gentibus (Romans, Greeks, Aramaeans, Canaanites, Phoenicians, Philistines, Nabataeans, Moabites, Ammonites, etc.). Their universal language was Aramaic but in the cities Greek and Latin were also spoken. Around the 7th century, when by this time the whole of Palestine was Christianized, the Judeo-Christians disappeared from the Holy Land, the community ex gentibus continued to expand notably, even evangelizing the Bedouins. Again in the 7th century, with the arrival of Islam, the scene began to change “slowly but radically”: the language and culture became Arabic and Christianity began to withdraw. “Simple, people,” “lovers of peace” and “hospitable,” the Christians of the Holy Land also have an “extraordinary gift of endurance,” commented Patriarch Twal. At present, Christians number 450,000, hence less than 2% of the entire population of the Holy Land, while in Jerusalem their number does not reach 12,000. Despite the connotations of “little flock,” sadly and constantly, moreover, in diminution, the Christians remain “an integral and essential part of their community,” revealing themselves a “pad” between the two “majority presences” Jewish and Muslim. Then there is the phenomenon of the “intifada of knives,” which involves very young kids of 12-13 years age that, thus armed, fight for reasons that have nothing to do with politics. For their part, the Israeli military have “broken nerves” and, sometimes, open fire with much ease when it would be far more “human” to capture the delinquents and deliver them to the courts, stressed the Patriarch. In regard to the tragic situation of Gaza, Patriarch Twal lamented the “numberless painful consequences, especially among the youngest population, the profound psychic, relational and existential wounds left by the traumas suffered: following the three conflicts of 2008, 2010 and 2014, for whose reconstruction, the 5 billion dollars allocated were never released, the reason being that peace is the conditio sine qua non. A decision for which “we cried victory: victory of the Israeli judges that obeyed the military orders, victory of the Saint Yves Legal Society, which took the case in hand, victory of the Christians that prayed every Friday in the field to impede the construction of the wall,” said Patriarch Twal. The Israeli government is such that, although proclaiming itself “secular and democratic,” in reality is behaving increasingly as a “Jewish confessional military regime,” lamented the Patriarch, referring, among other things, to the school system, in which all pupils, including the non-Jewish, receive only the teaching of the Jewish religion and the Christians thus risk “losing their roots,” while subsidies to Catholic schools have been reduced. A paradoxical aspect of this state of things is that, although with a notable flow of tourists from all over the world (China and Japan included), to come to the Holy City with his community the parish priest of Ramallah must ask for the government’s authorization two months ahead of time and the government itself decides at its discretion if he can go, also leaving at home and allowing to depart members of the same family. If Israel would like to become a truly “democratic” and not “Zionist” State, the hope should be for the birth of “two States” Israeli and Palestinian, with clear and secure borders, as desired by the International Community and also by the Holy See. 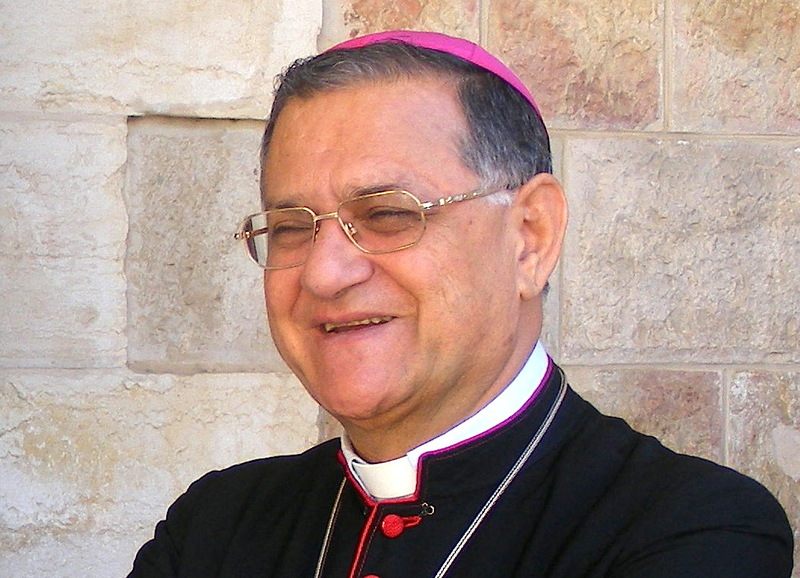 Responding to a question of ZENIT on the situation of the refugees in the Middle East and in Europe, the Latin Patriarch of Jerusalem stressed that in Jordan alone, the refugees constitute 20% of the whole population, hence a percentage some twenty times higher than the numbers of the Old Continent. “You have everything in Europe, but not the courage to deprive yourselves of something. I was in Austria, where I saw tens of abandoned country houses, which remained empty. If we don’t want the refugees to come to us, the International Community and politics must make peace in their home, and they will gladly stay. If, however, we, out of interest, sell arms and make war in their home, those will be the consequences. We can’t play with the destiny of peoples!” added the Patriarch.